More than one million plastic bags are consumed globally every minute. The habit of supermarket convenience living is having a massive impact on marine wildlife as turtles, fish and sea dwelling creatures swallow the bags. If that's easy to swallow as a consumer, then let the fact that they look awful be the deterrent and instead go for something more attractive on your arm. So in a bid to find both eco and cool, here are some options. 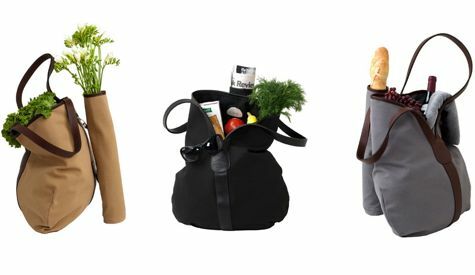 Love these Sac a Baguette totes for groceries ($329), top. You can make a cheaper alternative by using this animated guide from Morsbag. Colourful, reusable, machine washable, foldable bags from Baggu ($9), above.